Opening Wednesday March 29 at apexart, 6 pm to 8 pm. On view through May 27. 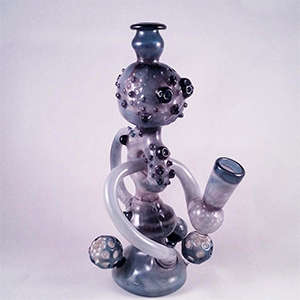 The show, organized by David Bienenstock and presented by the ever-interesting apexart, takes a deep dive into the legacy of pipes, bongs, and their makers. Bienenstock, who formerly served as Head of Content for High Times and has published two whole books centered around lighting up, seems to really know his stuff. A cursory browse of the pieces (heh) that will be on view shows a wide range from highbrow to lowbrow and everything in between. You’ll find everything from works by the historic Bob Snodgrass, who peddled intricate handmade creations to Deadheads aplenty, to a big glass monster truck and a pipe with a built-in mustache that could very well be found at your local Urban Outfitters. 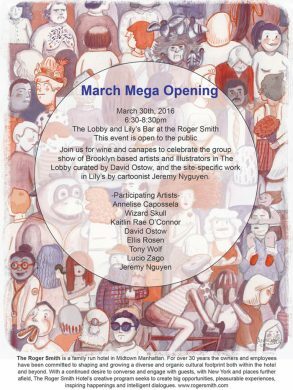 Opening Thursday March 30 at The Roger Smith Hotel, 6:30 pm to 8:30 pm. Though this hotel is in Midtown (sigh), the art being shown inside of it is all from the brains of a group of Brooklyn comic artists and illustrators. They first showed their colorful and humorous pieces inside The Loom during this past Bushwick Open Studios, and now they’re moving uptown to brighten up the hallowed halls of a place where tourists will sleep. They’re martyrs, really. Included among this group is comic artist Jeremy Nguyen, local satirist and author of comic book Stranger Than Bushwick, who we just spoke to about his recent accomplishment of becoming a New Yorker cartoonist. There will also be work from Tony Wolf (Greenpoint of View), irreverent graphic artist Wizard Skull, and several others. 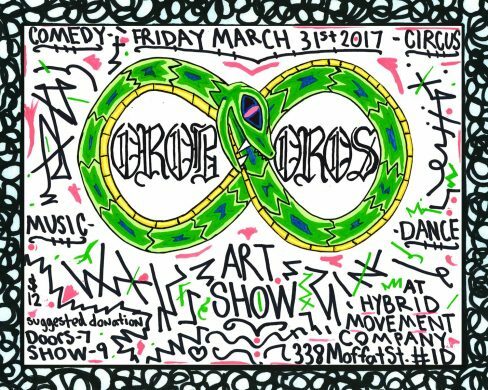 Opening Friday March 31 at Hybrid Movement Company, 7 pm to 11 pm. $12 suggested donation. If you’re into visual art shows that double as a night of performance, this could be the evening for you. Curated by visual artist, boylesque performer, and B-boy dancer Zoob Fernandez, this show has no shortage of stuff to look at. It’s even billed as a “multisensory extravangaza,” so maybe if you’re lucky your sense of taste will be catered to as well, aka maybe there will be free food. Who knows? In addition to a spread of visual art, Oroboros will host several types of performance artists, comedians, dancers, circus artists, DJs, and “rituals,” because it isn’t really in Bushwick nowadays if it doesn’t have some sort of mystical bent to it, right? Opening Sunday April 2 at Kunstraum LLC, 4 pm to 6 pm. On view through April 30. It’s still unfortunately true that society is quick to call women crazy in response to them doing, well, most things. 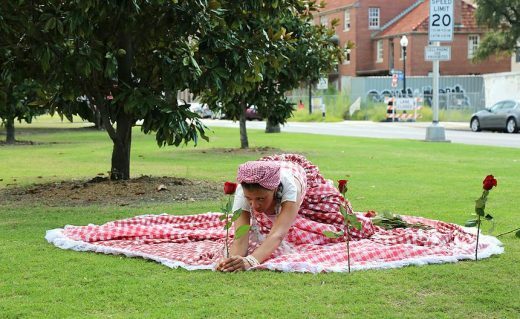 This Sunday, you can see the work of four artists have decided to embrace and/or subvert the terms largely associated with womanhood through their artistic practice. The gallery has assembled a diverse group working in a variety of mediums, from videos of soft and cuddly plush creations to mixed media collage and performance art expressly aimed at “destabilizing” the patriarchy. The show is the beginning of a season of exhibitions at Kunstraum curated by Katya Grokhovsky, founder of “in-flux curatorial platform” and conversation series Feminist Urgent.